Lots of people have digital cameras but don’t really know how to use them yet. That’s nothing to be ashamed of, digital cameras can be complicated! But, with a few clever photography techniques, you can take incredible photos of the most ordinary places. This course will guide you through the most important settings on your camera and teach you some photography basics, showing you how to get the best picture possible with your neat little gadget. This course is going to show you how to capture those truly beautiful moments forever. This skill can make the walk home from work or the next holiday abroad that little bit more interesting. 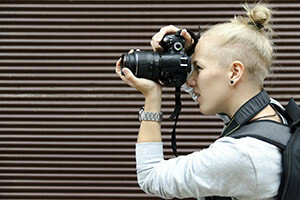 The course begins by teaching you about each of the command modes found on most DSLR cameras. You will learn about the relationship between Shutter Speed, Aperture and ISO and how to use them to get your perfect shot. Next, the course will then introduce you to the structure of lenses and what different types of lenses are used for. You will also learn about the different types of light and why it needs to be balanced using the white balance function. Using non-technical language, the course will then guide you through Photoshop and Lightroom, showing you how to use these software programs to manage images subtly and create great catalogues. Images can be inspiring, far more inspiring than text and even speech. But more importantly, taking a cool photo is just good fun! And it really is less complicated than you think, in less than 3 hours this course can show you loads that you never knew. These are skills you can use to enhance any walk you go on for the rest of your life, or even start your career as a professional photographer. So, get beyond the automatic setting on your camera today. The ability to take that perfect shot is just a short journey away. Outline what each of the functions on the Mode Dial are for. Identify all the parts of a lens. - State the pros and cons of Prime Lenses. Explain the relationship between Shutter, Aperture and ISO. Discuss the different types of light and their effect on a photograph. Navigate around the functions and tools in Photoshop. Explain the benefits of using the edit history function. Differentiate between subtle and obvious Photoshop edits to a photo. Outline the key functionality of the modules in Lightroom. Good course, I have a previously background studying photography, and this course helped me remember skills already learned. Excellent.! It's very easy to understand the lessons as the module is broken down in many parts to learn details of each topic. The video tutorial helps me to perceive easily also. Thank you Alison.com!